Government of Punjab has taken an initiative to equip the unemployed youth with productive skills to obtain better employment opportunities. The program is named as "Punjab Youth Internship Program". 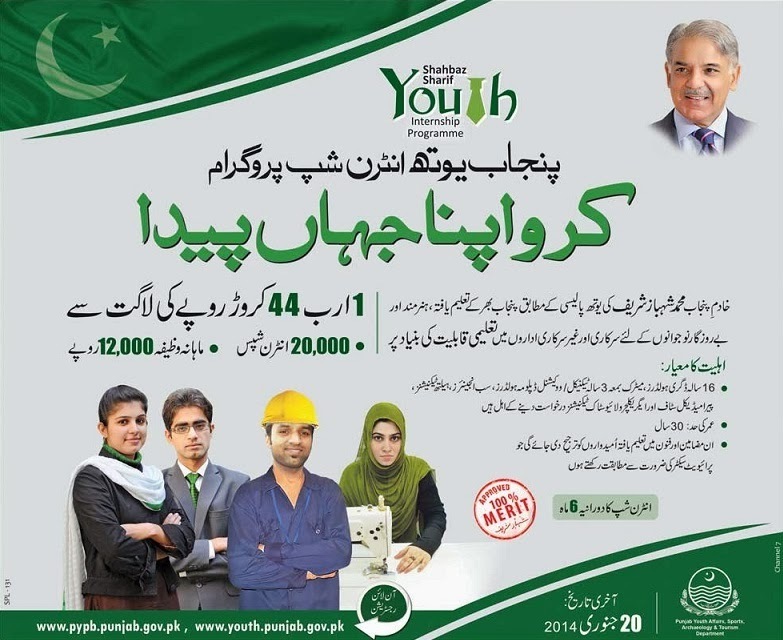 The idea behind this youth internship program is to train the unemployed educated youth of Pakistan. In the first phase Punjab Youth Internship Program will benefit 20,000 fresh graduates who shall also receive a monthly stipend for the duration of this internship. All interns who will successfully complete the internship will be awarded the internship completion certificate by the respective private / government organization. How to Apply for Youth Internship Program ? The last date for registration is 20 January, 2014. Duration of the internship is six months and the interns will receive a monthly stipend of PKR 12,000/- during the internship through Easy Pay Card.